New York-based KeepSolid, is a company with an excellent portfolio of services that support security, privacy protection and productivity. 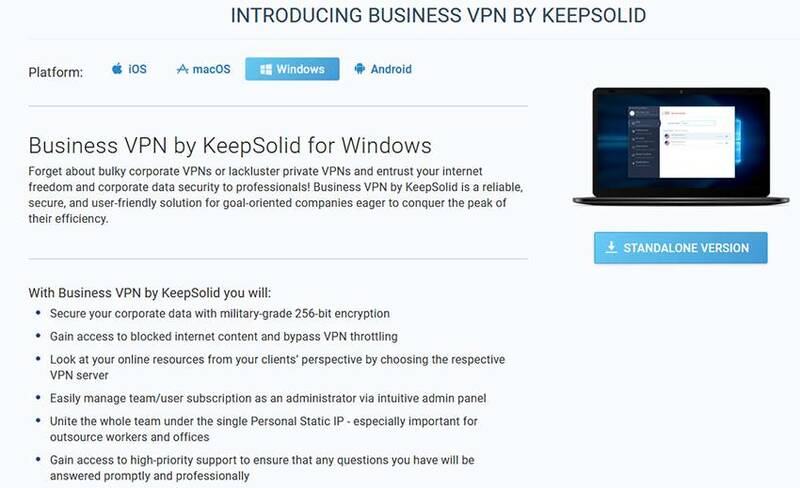 In this review, we will focus on KeepSolid’s Business VPN solution, which allows small and medium companies to keep their online data protected, for an affordable price. If you run a business with multiple devices that have to be secured, or if you are constantly on the go due to work and you need to get remote access to your company network, KeepSolid could be the perfect choice for you. The service is fast and flexible, giving business users the chance to access and manage their data, create teams, set up permissions and more, in a convenient and secure way. Thanks to KeepSolid Business VPN, communication and access to information are simple, and teams can collaborate without compromising the security and privacy of the company’s data. What are the benefits of using KeepSolid? To get started, you need to create an account and select one of the plans available. Then you can add users, teams, select VPN servers and download the software. The first thing that you notice when you start using KeepSolid is the convenient control panel that gives you the power to manage your teams and servers in any way you require. The control panel is your one-stop shop to create teams, adjust VPN settings, manage VPN servers and complete any other tasks that may arise. KeepSolid facilitates collaboration across teams and allows you to escalate issues faster. If there is any technical problem, you can simply select the “Write to Admin” option to reach out to your team expert instantly. Contacting the tech specialist directly, without having to go through additional steps means that the issue can be addressed faster, which reduces the impact on productivity. With KeepSolid’s business solution, your entire team is supported so you won’t have to get individual VPN subscriptions for each team member. Everyone can access the VPN servers available and the extensive selection of locations and servers supported ensure that all your teammates enjoy the best possible performance, no matter where they are working from. 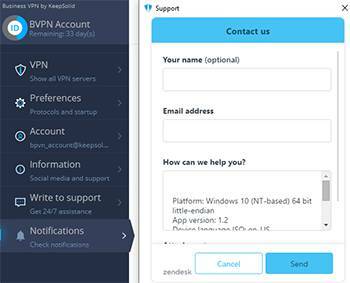 KeepSolid Business VPN works with Windows, macOS, Android and iOS, which are the leading platforms available in the market. The software offers all the features needed to manage your teams and keep your business’ data secured. You will also be able to overcome restrictions to get access to international content or to test your products in different markets around the world. There is a wide range of servers available that will allow you to overcome blocks, or to see how your international customers see your ad campaigns. One of the main reasons to use KeepSolid Business VPN os the security and privacy protection that it provides. You can secure your corporate data, your transaction, communications and more. To ensure that all your information is safe, KeepSolid uses 256-bit encryption. This high level of protection gives you peace of mind as it ensures that the privacy of your data is maintained, even if you need to use a public WiFi hotspot. On top of that, KeepSolid offers DNS leaks protection to ensure that your real IP or location are not exposed. 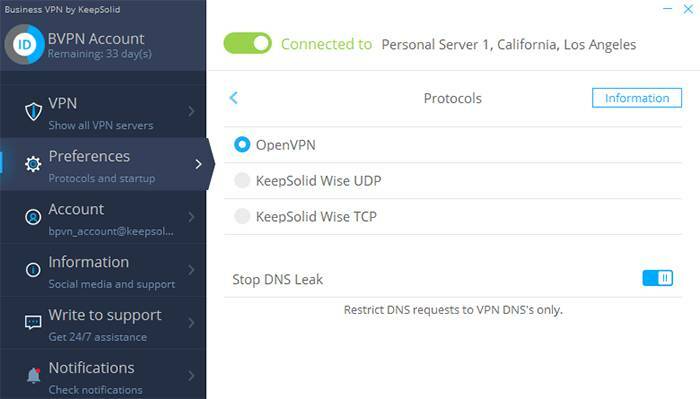 You can opt for standard OpenVPN, or a customized OpenVPN developed by KeepSolid called Wise. This protocol provides extra stealth by using TCP and UDP port 443 along with packet inspection protection by masking your traffic as standard HTTPS traffic. In other words, in conceals your web activity from being seen as an encrypted VPN tunnel in the first place, making it hard to block, even in countries like China. Another advantage of using KeepSolid is that due to the vast selection of servers and locations supported, you and your team will be able to access online content without issues. KeepSolid strives to offer fast speeds and reliable performance so that you can work from any location without facing restrictions or security concerns. On the flip side of unblocking online content, the static IP address personal VPN servers allows you to secure and block access to your business network from unauthorized IP addresses. This makes it very easy to manage employee logins through the VPN when they are working remotely. This allows to provide access to workers at home, travelling, or just outsourced as some examples. Using KeepSolid Businesss VPN brings strong protection and access to fast servers, allowing you to manage important data without compromising its security. You won’t need to worry about threats like eavesdropping or cyber crime. You will be able to focus on your work, while KeepSolid ensures that your information is secure at all times. The military-grade encryption supported will secure every aspect of your business, including the data of your customers. Corporate security is essential and KeepSolid is designed to provide the highest level of protection, without hindering the performance and speed of your network. KeepSolid is a practical solution for businesses thanks to the simple, yet comprehensive management portal. 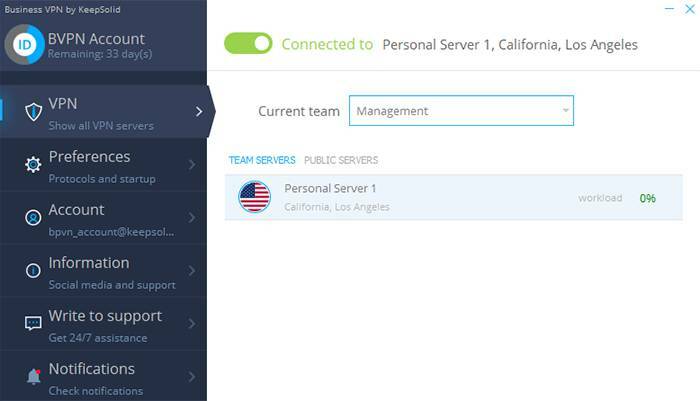 It is possible to add employees, create and manage teams, control permissions and grant accesses to specific private servers, all from the same interface. 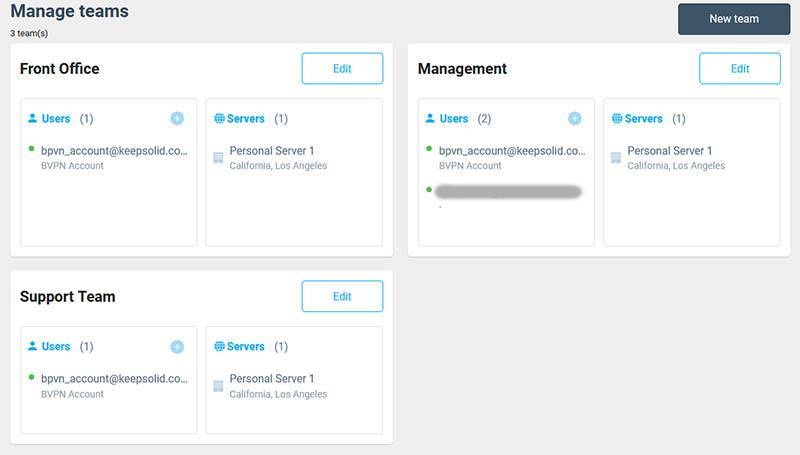 In addition, KeepSolid gives you access to Personal Servers specifically set for your business, which can be used to manage ad campaigns, access international platforms, test services and more. The private VPN servers allow users to get the best possible experience and will also boost the security and even productivity of your business for both Local and Wide Area Network needs. Business VPN is not only an efficient and reliable solution, it is also an affordable one. There are two set price categories designed to support small and medium teams, but you can also apply for a custom plan that suits your specific needs. The fixed plans are divided in two tiers. If you need support for up to 10 users, you can opt for the small team plan. The total yearly price for 10 users is $1199.99 ($9.99 per user, per month) and you get one private server, support for 50 devices, top encryption and access to over 400 public servers in more than 70 locations around the world, as well as dedicated customer support. If preferred, you can opt for the monthly plan, which costs $119.99 or $11.99 per user. If you have more users in your team, you can opt for the second fixed plan, which offers support for 30 people. 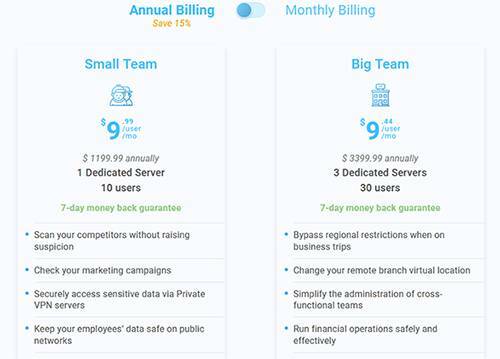 This plan costs $3399.99 for one year of service ($9.44 per month, per user) or $339.99 per month ($11.33 per user) and it features 3 private servers, plus you will be able to use up to 150 devices. Like with the previous plan, you will be able to get access to more than 400 servers in over 70 global locations and will enjoy premium customer support and military-grade encryption for your data. The payments are managed by the team admin and there are different methods accepted including cards and PayPal. KeepSolid knows that its product offers high quality and great results, which is why it offers a 7-day money-back guarantee, as well as a free trial that lets you check the service out, before you even set up a subscription. I would argue that the biggest advantage of a business class VPN beyond having dedicated IPs is the level of support received. Time is the most valuable asset for a company or person, but it’s also a costly one. Although problems are unlikely to be faced with such a simple application, if you do need support, you usually need it now while you’re IT support is costing you big money. KeepSolid Business VPN customers can expect top quality support whenever needed. The service is so easy to use, that even if you haven’t used a solution of this kind before, you will be able to manage the admin panel like an expert. Still, the customer support team is available 24/7, so if you have any query or issue that requires immediate attention, you will get the help you need without delays. You can use the contact form or send an email directly to the team and expect an answer within the hour at most. KeepSolid Business VPN is perfect for companies with remote offices, regular business travelers, advertising agencies and any business that requires a high level of security, and flexibility. With KeepSolid Business VPN, you will be able to bypass restrictions to get access to the content that you need, monitor your products’ performance in international markets, check your competitors and more. The private servers enable you to access confidential information securely and to manage tasks and transactions effectively. KeepSolid is a simple and reliable solution to access sensitive data and to support your business’ productivity from any location.